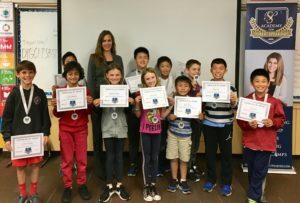 The Academy for Public Speaking offers fun, interactive after school enrichment classes through the Solana Beach School District and the Del Mar Union School District in San Diego. Students have fun and gain confidence, public speaking, and leadership skills from participating in our highly interactive public speaking courses. 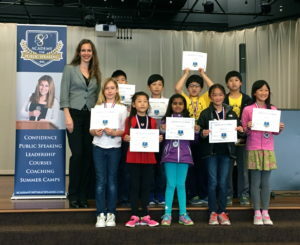 We offer our public speaking courses during the fall, spring, and winter at Solana Pacific Elementary School and Solana Ranch Elementary School. The public speaking class at Solana Pacific will meet on Wednesdays from 3-4 p.m. beginning on October 3rd. The public speaking class at Solana Ranch will meet on Thursdays from 2:55-3:55 p.m. beginning on Oct. 4th. The deadline to register for the fall 2018 public speaking courses at Solana Pacific and Solana Ranch is Thursday, September 27th. For additional information and to register, please use this link. This entry was posted in Academy for Public Speaking, Communication Skills, Confidence, Leadership Skills, Public Speaking, Public Speaking Classes, Public Speaking Courses, Public Speaking Skills, San Diego, Speech and Debate and tagged after school enrichment, public speaking classes, public speaking courses, san diego, solana pacific, Solana Ranch. Bookmark the permalink.